Immortal Day is a free browser based text-adventure for ages 17+ where you can masquerade as a vampire, hunter, hybrid, lycanthrope or a zombie. It’s simple to set up an interesting new character account and you can also easily log in via Facebook. Forget about tending your crops in FarmVille 2 because this dark supernatural experience will see you checking in on your dangerous new persona regularly. The developer, Vampire Games Online, express an appreciation of the supernatural immortal theme by sharing an entertaining, if a bit nostalgic, list of inspirational vampire and werewolf movies, such as the classic Nosferatu (1922) and the stylish Underworld saga, along with old-school games like Castlevania and Vampire: The Masquerade—Bloodlines to help solidify the theme of this world. The initial landing page has neat artwork that lets your imagination run wild and gives you a good feel for the shadowy universe you will be playing in. The hunter class is reminiscent of the Van Helsing trope we see in modern adaptations of the literary icon; the lycanthrope looks as fierce as a hairy loup garoux; the vampire represented is a curvaceous temptress clad in skin-tight leather pants; and the hybrid looks as though she fled Mordor and took refuge in Pandora. Good text-based adventures rely on solid writing to immerse the player. At first, there is no arc plot to get suddenly embroiled in here, just a series of instances that net you cash rewards, attribute boosts and consumable items. It’s enough the get a new player used to the functions and regular activities of gameplay, which is frankly perfect for the casual gamer. As soon as you log in you are bombarded with so many choices. At a glance the home page can seem daunting. Too much text on the screen can be information overload. Fortunately, there is also a character guide named Nikita that will email you a five part series of messages with all sorts of helpful tips and step-by-step character class specific training advice, so you can fully immerse yourself in all the aspects of the game without getting lost along the way. As you build skills and experience as a player, so does your character. The sidebar also contains many useful links for newbies. 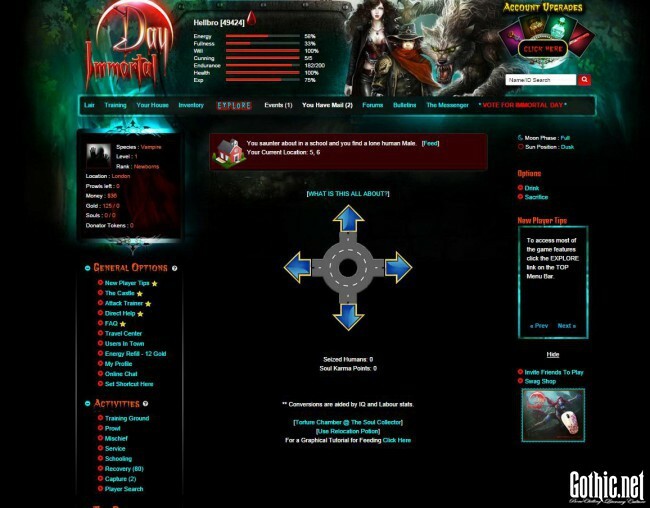 A newborn vampire, for example, is encouraged to scroll through new player tips and then visit The Castle, which features a step-by-step tutorial with visual aids to explain all of the important aspects of the game. A vampire can prowl up to 75 times a day, which is a bit of a click and repeat process. This is where you can randomly get lucky and score some loot and receive other character improvements . Occasionally you will receive gold coins and every now and then your prowl will turn up nothing at all. Immortal Day also teases some perks and bonus items with an occasional few rare tokens (normally purchased via PayPal) to tempt you to partake in their pay-to-play character advancement micro transaction finance model. 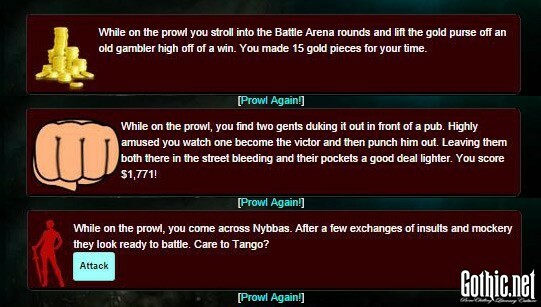 Prowling can also prompt some exciting combat encounters. Sadly, if you do not have the energy to duel right then, than that battle opportunity will be missed, so be sure to rejuvenate your energy reserve as you prowl around. I feel like it would have been great if you could still battle an opponent during a prowl opportunity on zero energy, provided your character is penalized and has a low chance of winning. More risks would make Immortal Day more exciting, but maybe that says something about my style of play. So long as you have decent armor for your hands, torso and feet—and you have a nice primary weapon, you should triumph in nearly every scrape. Hopefully, as the levels advance, there is a difficulty curve because the game starts out a little too easy at first for my taste. Combat is fun though. You pick an equipped weapon and click. Both parties take damage and rounds continue until someone loses all of their hit points. The victor can choose to mug (steal cash), pummel (cripple) or leave the victim alone (earn experience). Tarot consulting, like prowling, awards the player random items or nothing. Madam Margaret can be generous although free players are limited to 20 readings a day. One thing you learn early on is to plan ahead. A new account is limited by a resource known as ‘energy’. You can only perform so many actions without the precious energy to expend. You need energy to improve your character’s core attributes (defense, speed, accuracy, strength etc) so that they have a better chance to prevail in combat. If you are running on empty you can spend gold coins to replenish your energy reserves or you can visit the citygrid and feed on human blood. To navigate the citygrid you click arrows to traverse particular roads that lead to houses and other public spaces. Every so often you may encounter a potential victim. Variables such as time-of-day (dusk etc) and your own stats will influence your chances of a successful feed. If you have the energy you can also train to improve your core attributes. To exploit multipliers you can rent better gyms to train in. All gyms are level-capped and require a little money so always think ahead. Other quirky actions include serving the Ancients and performing Mischief missions. A new player can sweep the crypts to appease the beings of old and you can earn a lot of experience by thieving. The Mischief tasks are pretty easy which is a bit unfortunate. Again, I certainly hope these aspects of the game get harder for more experienced players because these day-to-day tasks could offer more challenge, to keep things more exciting. If you like bean counting you can always rort the system and play the wealthy angle. There are casino games like poker and black jack and you can deposit all of your hard-earned coin in a bank account. Yes, you can spend 5K or use your newbie cheque for 25K (if you have one) to open a savings account. There are no withdrawal fees however every quarter the game slugs you. Enjoy the daily interest though. Your lair is a big deal. The better your home turf is the better your stats become. A vampire starts the game with a grave. After a day of prowling and fighting and tarot consulting you should have enough money to rent a better abode. Lairs are capped by player level so you have to work your way up from railway arch to a mausoleum to a cheap motel room. If there are any major aspirations in Immortal Day it would be striving for the best home. You will visit the lair page often as it will remind you with a list of available actions waiting to be completed. If you really like Immortal Day then consider upgrading your account. There is an active community and helpful admins ready to answer your questions. 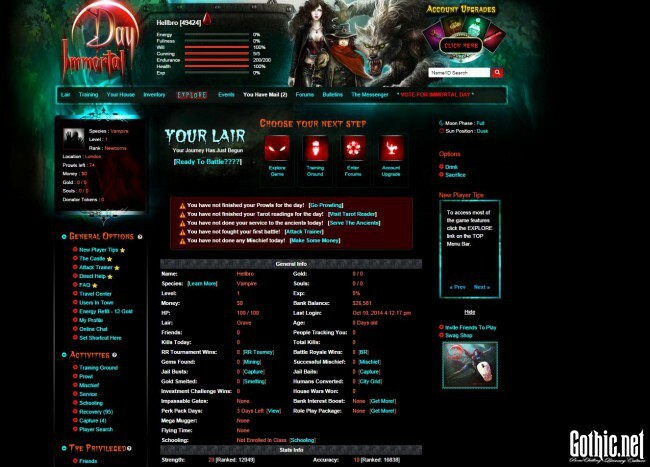 The Internal message system is great and there are forums for like-minded players to chat. Keep in mind that this game is also intended for under 18s so the admins do not tolerate inappropriate discussions. There are also houses (think guilds) that you can join. All new players are welcome to sign on for the fledgling camp while they learn the ropes. Be careful though: some houses are at war with others so do your research before agreeing to join a group of fellow immortals. Immortal Day also runs well on Android mobile devices and is a fun time-waster throughout the day. We have only scratched the surface in this review. Upload your display picture and start clicking. Posted by Luke Applebee on Wednesday, October 15th, 2014. Filed under Games, Headline, Lifestyle. You can follow any responses to this entry through the RSS 2.0. You can skip to the end and leave a response. Pinging is currently not allowed.